Eurol introduces Eurol Protence 5W-30 GN II & Eurol E10 Improver | Eurol B.V.
LSPI is a phenomenon that occurs at low speeds in small engines with relatively high power (the engine will ping / knock), with disastrous consequences for the engine. This oil is also very suitable for Japanese hybrid vehicles where ILSAC GF-5 and API SN are prescribed. Eurol Protence 5W-30 GN II, E100255, is a solution to minimize the occurrence of LSPI in GM/Opel cars. This product is available in 60 liters and 210 liters. 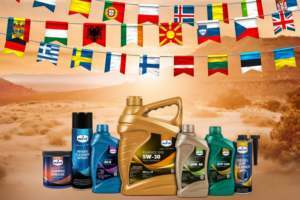 The Eurol additive range has been extended with the Eurol Petrol E10 Improver, E802513. This fuel additive protects the fuel system against the potentially harmful effects of E10 fuel, which is offered on a large scale worldwide and even is mandatory in some regions. Eurol Petrol E10 Improver has also been developed to clean the entire fuel system and the injectors. This provides better fuel economy, more power, better acceleration and reduced emissions. Eurol E10 Improver, E802513 is available in a handy 250 ml dosing bottle, available per 12 in a box.